Get free Checklists for Starting a New Business to help secure starting your new small business. 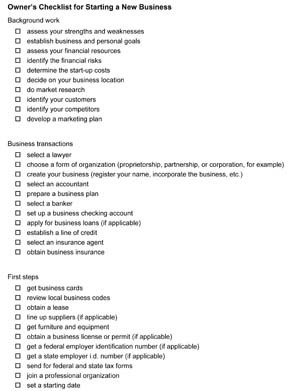 The Starting a New Business Checklists below provides the basic steps you should follow to start your new small business. The Starting New Business Checklists along with the other important checklists below are dedicated to helping you start your own small business as quickly and as easily as possible. Starting your own business involves planning, making key financial decisions and completing a series of legal activities. Take advantage of the free business checklists below to help start your small business and customize them to meet your requirements. The Sample Agreement to Form Business Entity contract can be used when two or more individuals decide to form a business entity together. There are times when the parties might not follow through on their promises and will fail to contribute anything towards the costs of forming the business entity or even fail to contribute any capital to the business entity. The business probably will not be able to continue without the sharing of the costs or the additional capital that was expected. For more information and to download, customize and print the sample agreement just click the link below. Click here for more information and to access the Sample Agreement to Form Business Entity. Another helpful site for starting a business is StartingYourBusiness.com. They have rules and regulations for starting a business in every state plus there are free business advisors you can talk with.